Resolutions were on display in the canteen at lunchtime. The first day back at work found a far larger than usual number of people choosing salad for their lunch instead of any other offering. 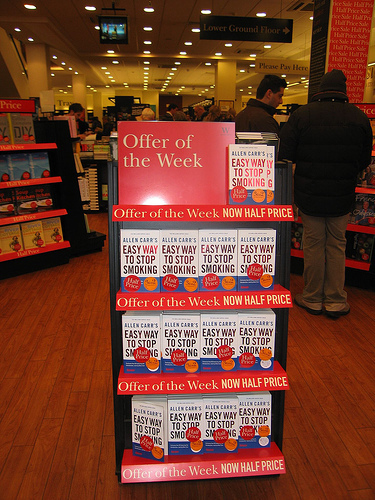 Walking into Waterstones, another favourite resolution was being encouraged – giving up smoking – with this highly visible display of half-price books to support you in giving up the easy way. This entry was posted in life, marketing by Rachel. Bookmark the permalink. it’s a good book though and should be given out by the NHS instead of nicorette patches! Having been lucky enough never to have been tempted to smoke, I never looked at the book. But it’s perfect placement (right at the front of the store by the doors) to get people who have made the resolution do something instead of just think.